Can’t think of anything right now but the sound of sizzling pork fat. This sign is much more clear than the mystery math sign we found earlier. 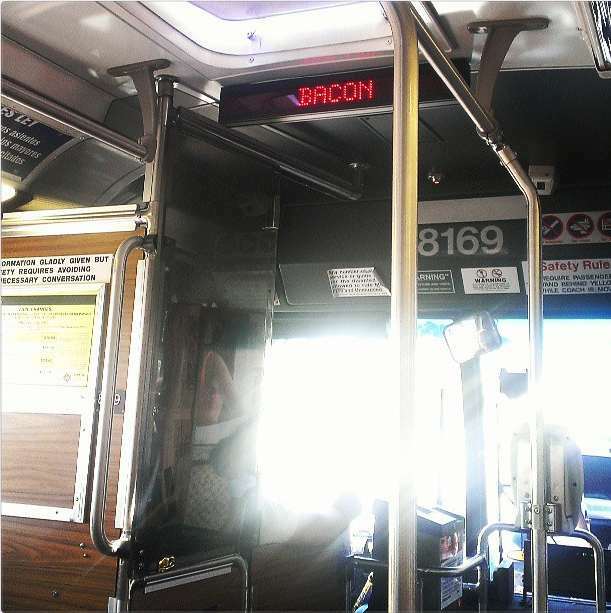 Pretty sure it just means that the bus is about to stop at Bacon St. Yes yes I know Bacon is also a street but wouldn’t it make my day better if this is just the meat gods telling me to stop eating my stupid salad for lunch and buy bigger pants because life is better with bacon? If you want to shorten your life by eating too much smoked cured pork belly I am in no position to stop you. smh. It’s the Portola, not the Excelsior. You are making this sign seem like something out of the Beggin Strips commercial ( faux bacon for dogs).